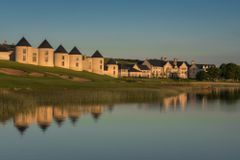 Situated on a 600 acre peninsula in Northern Island golf resorts do not come much better than Lough Erne and its impeccable quality was recognised in 2017 when it was awarded Hotel of the Year. The fantastic five star resort is truly a place for everyone to enjoy whether you are a keen golfer or a holidaymaker looking to relax in a spectacular setting. The state of the art Spa is the perfect place for you to spend the day pampering yourself with a number of treatments for you to choose from. In addition to this, guests are also treated to not one but two championship golf course with the Faldo Course leading the way - a layout which is ranked inside the top 3 courses in Northern Ireland. For those looking to for the UK golfing getaway of a lifetime then Lough Erne Resort is the place for you. Tea/Coffee and Bacon Roll on Arrival! and One free drink in the Loughside Bar! Opening on the 1st July 2009, the Faldo Championship course at Lough Erne is the latest European project to be unveiled by the six-time major winner and now pre-eminent player-architect of his generation. The modern championship layout is a genuine tournament layout that is set to be featured on the European Tour in the near future. Carved through mature woodland and then expanding along the lake shores, Faldo's course is majestic sight and a daunting test. Distinctive par-3s and phenomenal long driving holes are among the highlights of Lough Erne, a new star on the European golf scene. Lough Erne's inauguration was crowned by an amazing high stakes exhibition match between Ireland's two golfing stars - Padraig Harrington and Rory McIlroy. Opened in 1992, Castle Hume was the first course to be opened at the stunning Lough Erne Resort and is a pristine parkland layout that skirts the shimmering Castle Hume Lough and Lower Lough Erne. With over 7,000 trees lining the perfectly manicured fairways, the course places an emphasis on accuracy off the tee with an iron quite often being the more sensible choice of club. The manor in which the course glides over the natural contours of the terrain adds a different dimension to the course and means all aspects of your game must be on point if you wish to score well round Castle Hume. However, the course is not one of these modern day monsters that we have become accustomed to and as a result it is very much manageable for plays for all abilities. Perfect for golf societies and charity days, the course provides players with spectacular views of the natural surroundings as well as being the setting for an unforgettable round of golf. The distinctive Lough Erne architecture houses deluxe accommodation courtesy of the 120-bedroom hotel and the 25 luxury lodges; the high class country house style is complemented perfectly by outstanding facilities and amenities to create one of the most desirable destinations in Ireland. All the accommodations ensure dramatic views over the Lough and the stunning estate surroundings, and are complete with specially selected furnishings, high quality linen and deluxe bathrooms, and with the range of rooms, suites and the lodges, there will be an accommodation option to suit every demand. Guests can enjoy a tranquil spa journey inspired by Thailand in the authentic Thai Spa, which offers a wide range of Thai, ESPA and Elemis spa treatments. Spa facilities available include: The Infinity Pool, Sabai Sabai Room, The Light Therapy Sauna, Jacuzzi, Tropical Rain Shower and Lap Sabai Room. Executive Chef Noel McMeel and his culinary team invite you to choose from five unique dining experiences. Savour the resorts stunning setting in The Catalina 3 AA Rosette Restaurant; enjoy cocktails while sampling the eclectic Grazing Menu served in The Blaney Bar; or for casual dining choose The Loughside Bar & Grill which specialises in local produce. With world class golf, authentic Thai Spa and natural beauty at every vantage point, Lough Erne Resort is the perfect destination for a unforgettable break. Superb. Comfortable and close to the bar!! We were 8 golfers staying one night and playing 2 rounds. The staff were very welcoming. Check-in was easy and quick which is so often not the case in some hotels. Unfortunately, we didn't have dinner in the hotel as we wanted to spend the evening in Enniskillen but judging by the breakfast,I would certainly eat in the hotel next time. The breakfast was superb. I used the pool and Spa in the morning and it was most pleasant. It was my first time to play the course so I didn't know what to expect. There had been a good deal of rain so I was very impressed with how dry the course was. The greens were even a little crusty.It's a fine course; manageable for a middle-handicap golfer. The location is magnificent. Probably best appreciated in Summer or early Autumn. Will go back.